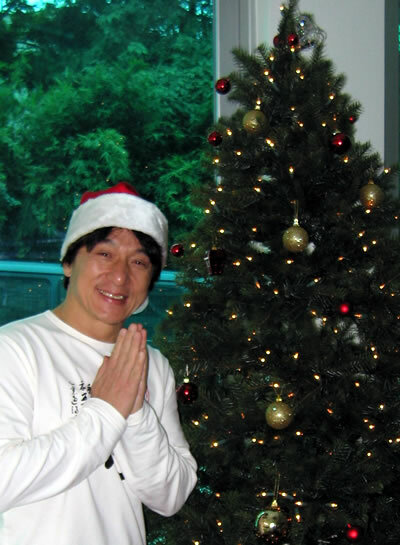 Thank you to everyone who sent in a Christmas card for Jackie (and Jones, and the JC Group, and the Webmaster, etc.). All the cards were wonderful and of course all deserve to win a prize. 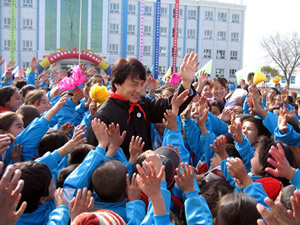 However, only three prizes will be awarded in three age groups. Stay tuned to the Kids Corner for announcement of the winners. Tons of new cards have arrived in the last few days (including another for Jones). Check out Jones's Clubhouse to see what Sukee sent! A big thank you to everyone who has sent me holiday cards. I really appreciate your thoughtfulness. Several people have sent gifts - thank you so much for these lovely surprises and Happy Holidays! New cards are posted nearly every day and today a card arrived for Jones! Check out Jones's Clubhouse to see what Kelvin, the German hunting hound sent. 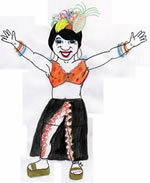 Here at the Kids Corner we are used to seeing Jackie dressed as Santa - usually the work of some talented artist. 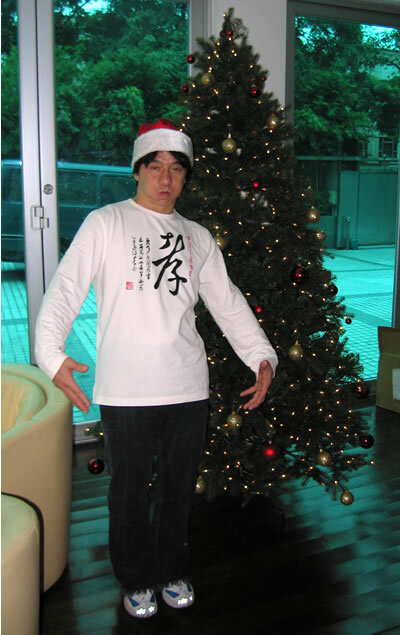 But today, Jackie took a minute from his busy schedule to pose with the JC Group Christmas tree! Here's what Jackie said when he struck this pose: "Draw me!" He was, of course, referring to the Kids Corner Halloween Costume contest. If anyone would like to draw Jackie as Santa, the Kids Corner would love to post your picture! Many new Christmas cards for Jackie have arrived also! Kids Corner cartoonist Holly has made an adorable drawing for Jones' Clubhouse. 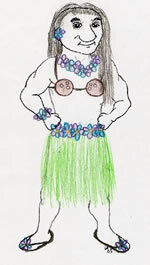 She has also made a line drawing for you to color in! Visit Jones' Clubhouse to see. Lots of new cards in the "Christmas Cards for Jackie" section. Click here to see them. Kyle from New York has sent in two very creative Buddy Bears to add to our collection. 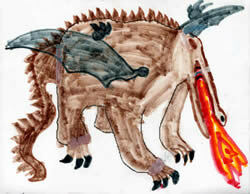 Click on his "Dragon Buddy" to see all the wonderful designs. Why don't you send in a Buddy Bear design? Jackie loves to see them and they're great fun to make. Maybe a Christmas Buddy Bear would be nice for the collection! 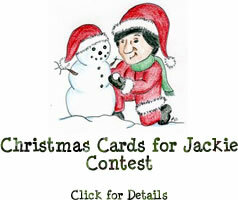 There are two new Christmas cards on the "Christmas Card for Jackie" page. 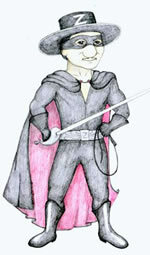 We have received very few cards despite the special prizes we are offering! To send a card, click on the image of Santa Jackie, above. 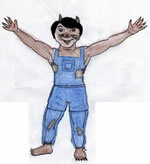 Visit Jones' Photo Album to see three new photos of the dog. He's gotten very big and he listens well. Jackie demonstrated a "down" command and Jones obeyed. After having a piece of apple and slobbering all over the staff, Jones was on his way in a tornado of golden fur! "Dear Uncle Jackie, How are you? I love you so much. I want to see your new movie. We all miss you!" This card was signed by 8 different students who all thanked Jackie for giving them a beautiful new school. New Feature at Kids Corner! Jones the Golden Retriever asked if he could have a small section of the website where he could visit with some of his friends and fans. How could we say no? So now he has his own spot and soon he will add more fun things to the Clubhouse. If you would like to make a drawing or painting of Jones, send it in and Jones will put it in his Art Gallery. Right now the Art Gallery is empty - it's your job to fill it! 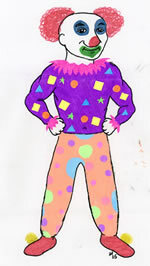 Soon Jones will post some drawings from Kids Corner cartoonist Holly to add to the fun. Enjoy! New Drawing in Art Gallery! 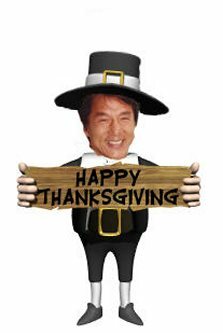 If you just send it to "Jackie Chan" or to "The JC Group" the mail handlers in the office won't know that it's meant for the Kids Corner and you will most likely never see it on the website!! IMPORTANT: Please (PLEASE!!! PLEASE!!! PLEASE!!!) write down what COUNTRY your postcard is from. Many postcards are either in a language the webmaster can't read OR they just have the town or village name but not the country. It takes twice as long to get the cards on the web if people don't write down the name of the country because the webmaster has to look them all up. YOU may know what country your town is in, but many people might not! Also, please make sure YOUR NAME is somewhere on the postcard. All these things will make it easier to get the cards posted. 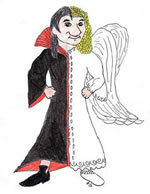 Congratulations to Charlotte for being the first person to submit an entry in the Christmas Cards for Jackie Competition. There's no prize for being the first, but still - Charlotte should be recognized for being so fast and inspiring others to send theirs! 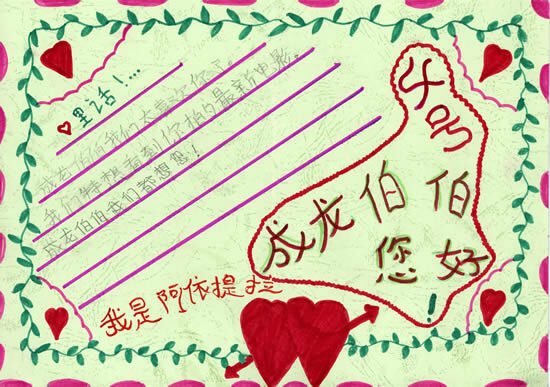 Charlotte also sent in photos of her pets, Project A and New Police Story. Click below to see all the pets named for Jackie! The Kids Corner "Decorate Jackie for Halloween Contest" was a huge success. There were over 80 entries! It took a while to get the final vote (Jackie's been so busy!) but the results are in. Here are some photos of Jackie doing the final judging. Here's what he said: "Tell them that the designs are all so good! It's very hard to choose!!" 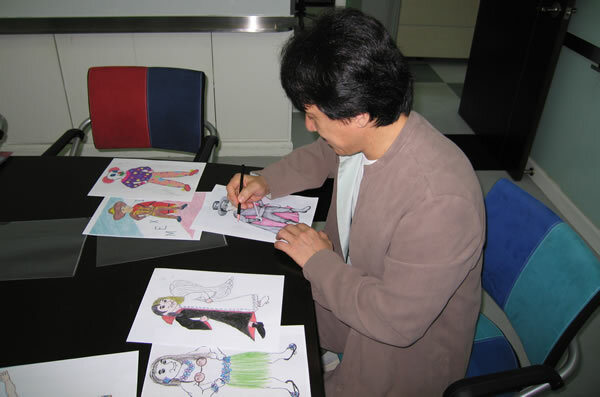 He made his final decision and then he autographed the First Place designs which will be sent along with the prizes to the First Place winners. Thank you to Willie, Solon, and Jackie for taking the time to judge our contest. All designs have been printed out and put into a book for Jackie to keep. First, second, and third place winners: Please email your postal mailing address to the webmaster! This year's contest promises to be even better than ever! There are some great prizes being offered, so get your crayons out. Click on Santa Jackie for info! Today we received a letter from an old fan of Jackie's whose work was featured here several years ago. 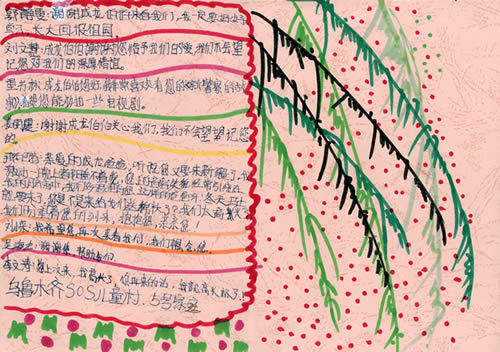 He's a sixth grader from Texas and he was one of the kids who took part in a project for this website to illustrate a Chinese Fairy Tale. He says that he's still a big fan and has even begun studying martial arts because of Jackie! Jackie loves to hear from his fans - thanks for writing, Tanner. 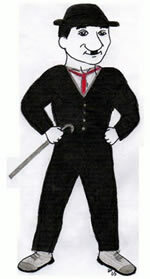 All entries for the contest have now been posted and the judging will begin. As you know, Jackie, Willie, and Solon have agreed to do the job and that means that it could take some extra time. Please be patient as all the designs are printed out and presented to the JC Group for judging. Check back here in a few days to see the progress of the judging. Thanks! 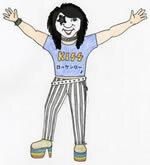 And thanks to everyone who sent in a design. 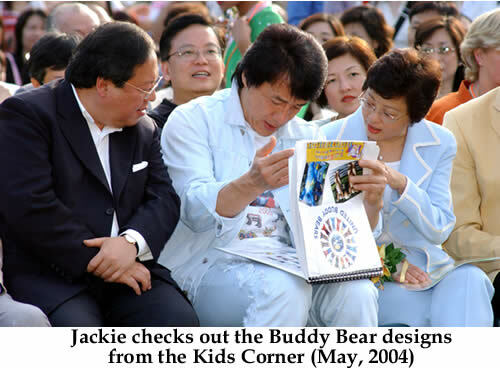 Jackie really loved them! Thanks to six year-old Katie for sending in her beautiful coloring page! 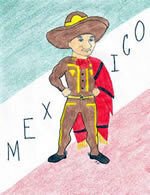 To see them all, click on Katie's drawing, above. 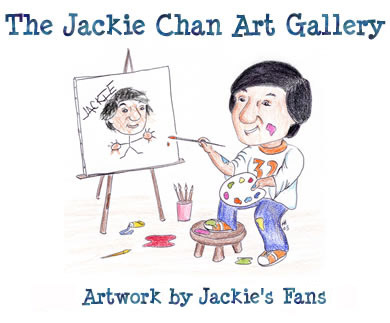 If you would like to make a page for Jackie's Coloring Book, click here!